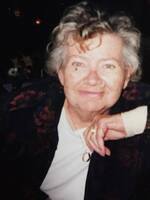 Provide comfort for the family of Barbara Eckhart with a meaningful gesture of sympathy. Highland Lakes, NJ: Barbara Ann Eckhart(nee Herrmann), 91 years old, died peacefully at home on Sunday, March 17, 2019. Born to Carl and Helen Herrmann in Roselle Park, NJ, she had lived in Livingston, NJ and summered in the Highland Lakes section of Vernon Twp., NJ before moving there in the 1980’s. Barbara started work at Eckhart Manufacturing Company, Roselle, NJ where she met her husband; she then owned and operated Circle Nursery School in Livingston, NJ for 20 years, retiring in 1983. Barbara was active with the Highland Lakes Sailing Club and Highland Lakes Bridge Club which she hosted at her home. Barbara is predeceased by her husband, Arnold Eckhart, Jr.(1995) and her son, Leonard Eckhart(2007) and is the devoted mother of Roger Eckhart and his wife, Judith of North Cape May, NJ, Raymond Eckhart and his partner, Robert of Blue Ridge Summit, PA and Kenneth Eckhart and his wife, Karen of Highland Lakes, NJ. Cherished by 7 grandchildren and 7 great grandchildren. Private funeral arrangements by Ferguson-Vernon Funeral Home, 241 Route 94(1 Vanderhoof Court for GPS), Vernon, NJ.